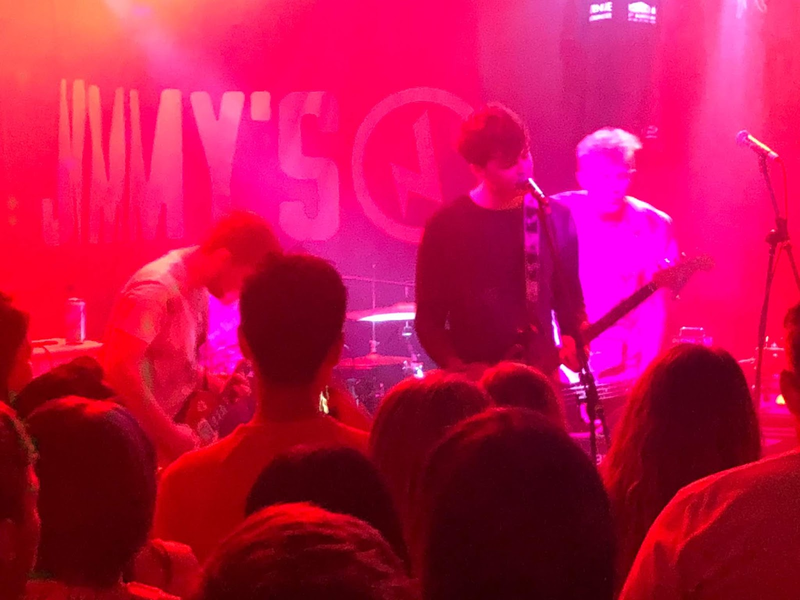 Matter Of Mind headlined the latest instalment of This Feeling club night in the intimate surroundings of Jimmy’s basement. A blistering half hour set that barely paused for breath got a rapturous reception that confirmed the growing belief that their breakthrough is just around the corner. With just a couple of EPs to their name and a set of new songs in the bag, Matter Of Mind’s reputation preceded them and expectations were at fever pitch as they took to the stage in the sweltering basement that was turned up to cooking point by the time Jordan and Ash finished final song and recent single Sanity in amongst us letting loose. What Matter Of Mind have learnt this year is control of their set to hit us with the maximum impact. Songs like forthcoming single The Blind Side build and build and then stop and career off in a different direction, the four of them intiuitively connected and dragging their audience kicking and screaming with them. They might possess elements of metal that’s piqued the attention of Kerrang heads but they mix it with a knowing nod to more pop sensibilities to create something that feels like a compromise-free crossover. Debut EP track Coffee Stains and Migraines is one of the beneficiaries of this more targeted approach, sounding a million miles away from the version that won us over a couple of years back but without losing its inticing ear worm charm. With Jordan and Conor often interchanging vocals, they offer something a little different to the four lads in a band formula that can tire without ingenuity and an X factor in the mix. Previous single Stay is a prime example of this and they’ve even got the breadth of catalogue to leave out the likes of Far Too Wrong, a song others might build a set around. All that’s standing in Matter Of Mind’s way now is that once in a lifetime break to seize with both hands. They’ve got the look, most definitely the sound and the focus and knowledge to take these songs to hundreds or thousands rather than dozens.